Works begins on Banffs historic Tolbooth Hotel. 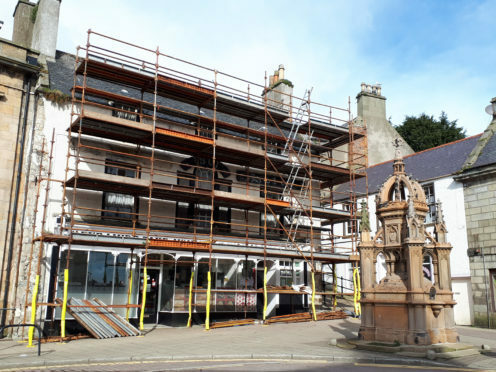 The Tolbooth Hotel in Banff is the focal point of Aberdeenshire Council’s efforts to improve the appearance of the town’s conservation area. The work follows on from a five-year project to breathe new life into the four ports of Fraserburgh, Peterhead, Banff and Macduff. And now, over the course of the summer, teams will begin refurbishing the premises. The work will include using traditional materials to repair its timber windows and roof, and the installation of new cast-iron guttering. Local councillor Glen Reynolds described the revamp as “great news” for the town. He said: “It is a reassurance to the public that much work is taking place by council officers who operate behind the scenes until the fruit of their work is seen in projects such as this. The hotel is a B-listed building which was originally constructed in 1801. In recent times, however, it has fallen out of use. Last night, Peter Argyle, the chairman of the council’s infrastructure service, said: “The delivery of this project, and others taking place in the four towns, is a visible sign of progress and return on our investment. Other works being carried out by the the authority in Banff includes the creation of a silversmith’s workshop in Old Market Place, which has been transformed from a derelict building and is due to open in the summer.